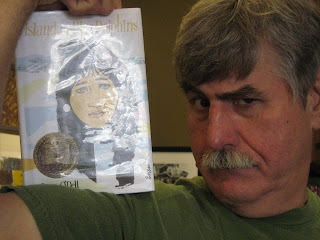 Michael Tells Us About Great Graphic Novel Goofiness! Stone Rabbit, Henri, Andy, Judy, Milton, and Grandpa are back in their newest comic book! 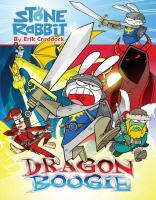 When Stone Rabbit, Henri, and Andy play a medieval board game with magic dice, they are transported to the land where the game takes place, where they must defeat the evil Lord of Darkness. All of their friends appear as characters in the game to help them along, and this book introduces a new character who turns out to be the ultimate villain. This book is for fans of Fishhooks, Fairy Odd Parents, Spongebob Squarepants, and other shows like that. This book is written and illustrated in the goofy-style humor that appears on many of today's TV shows for kids. So this book is really like watching TV. I was never really a fan of magic and wizardry, but this book doesn't focus so much on that as it does the humor that can come with magic spells. I think overall that this book is worth the read, but it's not real high on my top books to read list. Thanks, Michael! A lot of guys like goofy-style humor, so we may have some takers on this one. The library has copies of this book and others in the Stone Rabbit series, so come on in and take a look! Yep, that cover looks pretty goofy to me. That could be a high recommendation! I think I'll find a copy. How about you reader guys? Have any of YOU read the Stone Rabbit graphic novels? Did you like them? Your fellow reader guys are dying to hear what you think. Every once in a while the Iron Guy likes to set conventional wisdom on its ear. (When I say "conventional wisdom," I mean "The way people say it's always done") The conventional wisdom says that boys won't read books with a girl as the main character. Well, I stick out my tongue and say, "Ppphhhhttttt!!" to that. Give a guy an exciting story about a boy or a girl and he'll read it. I've seen guys sitting around the library reading Nancy Drew graphic novels. So there! I've got a book that any guy would enjoy. I read it several years ago (which makes it a Blast from the Past) and it's Island of the Blue Dolphins by the terrific Scott O'Dell. This is a great survival story in the tradition of Hatchet. (see my review of that book here) In this story, a Native American girl named Karana and her little brother get left behind when her tribe has to leave their island, which is a desolate spot off the coast of California. They learn to fend for themselves but then her brother gets killed by a pack of wild dogs. Can she learn to survive on that lonely island? Can she make peace with that pack of dogs or be killed by them too? Is it possible to make it through the winter on her own? Add to this an unforgettable fight with a "devil fish" and you've got one fantastic book that will stay with you long after you finish.So go and check it out. You'll really like it. This gets the Iron Guy Seal of Approval as One Terrific Book! Tintin is a reporter who is always finding intriguing stories to follow. Usually, he gets caught up right in the middle of his story, and he's always having to fight off enemies with guns and knives in addition to the ones trying to find creative ways of killing him. There aren't many dull moments in this series. When I first heard about it, I thought it was just a cute kiddie comic about a boy and his dog, but the dog, Snowy, really doesn't have much to do with the stories. If you like thrillers and hilarious lines, you won't better than this comic-book series right here! Read them all! If you're not sure about the Tintin movie, or if you really want to see it but it's not on DVD yet, then this novel is right for you. It has the exact same details and dialogue as the movie, and in some ways, this book is even better than the movie. The author has done well making the complicated scenes simple enough to understand without watching the movie. I think it's a great novel, and if you want to be the ultimate Tintin fan, then you can watch the movie and read the novel, like I did! It was a great book and a great movie. This is the final book in the Storm Runners trilogy. If you've read my reviews on the other two books, than you should be caught up. In this book, the Rossi Brothers' circus has gone missing in Mexico, so Chase, John, Tomas, Nicole, Cindy, and Mark head down to Lago de la Montana to go and find them. The only problem is that Lago de la Montana is right at the base of Mount Popocatapetl, which is showing signs of eruption, which could turn out to be the worst in its history. Plus, if the circus has had an accident, the animals could escape... and Chase would rather not have an incident like what happened in the last book happen again. Although all this suspense is built up, and it seems as though something great is going to happen, nothing actually happens. This book is more about the characters' relationships with one another and animal attacks more than storms. There is not one storm in this book, and in the end, Mount Popocatapetl doesn't even erupt. Plus, I don't approve of this being only three books. He could have had 50 books in this series! But he only chose three. I hate to say it, but this is the worst book in his trilogy. Look out for his next book coming in September: Cahills Vs. Vespers, book 4: Shatterproof. After 6 years, Alex, Sammi, and Herbert are finally back in this mediocre sequel! GOR-DON, the evil G'Dalien from the last book is back, and this time, he has a guaranteed plan to get rid of the three pretend Alien-slayers. Alex sets out on a mission to find his 110-year-old self, like Herbert, but Alex suddenly gets prideful and wants to be a solo Alien-slayer. Will Herbert and Sammi tell him the truth? The main happening in this book, however, is when GOR-DON, in disguise, tricks Alex into trash-talking the G'Daliens' sworn enemy, the Klapthorians! The Klapthorian general promises an attack on Earth! What will happen to the planet? Plus, Sammi thiks it's wrong to let all of Merwinsville keep thinking that the three of them are still real alien-slayers when they had really just used a life-size video game. She doesn't want to go back to the future, but Herbert made a rule that either all threre of them or none of them went through the wormhole. Could this be their last mission to future Merwinsville? It all unravels in this long-awaited sequel! Like I said at the beginning, this book is pretty average. It's mostly stupid humor and immature behavior, so it's a little boring. There was one really good thriller-type scene (no guns or anything), and that was my favorite part of the book. For those of you who read the original Herbert's Wormhole when it was released in 2006, I found that I'm really too old for the series now. It was great when I was 10 like the characters, but now the characters are still 10 and I'm 16. So, all-in-all, it's an average, nonsense book with a few exciting parts. It's probably worth the read. Thanks, Michael! We really appreciate the way you tell us just how you see things. The Tintin graphic novels have looked really interesting and now the movie novel does too. I'm sorry you found the last Storm Runners book disappointing. 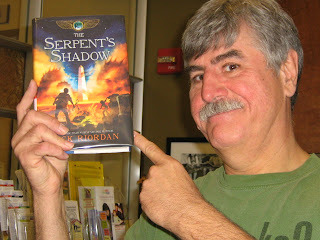 And the same for the Herbert's Wormhole book. But maybe there are a lot of 10-year-old guys out there who would like it! So you may have done us a favor. Have any of you out there read the Herbert's Wormhole books? Would you like to? Write in and tell us!! There!! 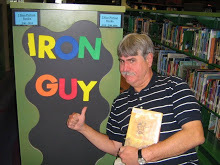 How could you argue with a MANLY MAN like the Iron Guy??? 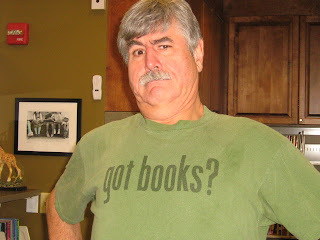 Hey all you reader guys in the fabulous land of blog! This is Iron Guy Carl and I'm sorry that I haven't been around for a while. Life in the library gets very busy and sometimes I hardly have time to read, much less blog. But the Iron Guy always rises to the occasion and so I've decided to re-institute the Blasts from the Past, something I tried a couple of years ago. That was when we were all undergoing major changes. There was no time at all for reviewing new books, so I recommended books I'd read before but not reviewed. One was The Whipping Boy by Sid Fleischman. (see the post here) The other was The Hound of the Baskervilles and you can see that post here. 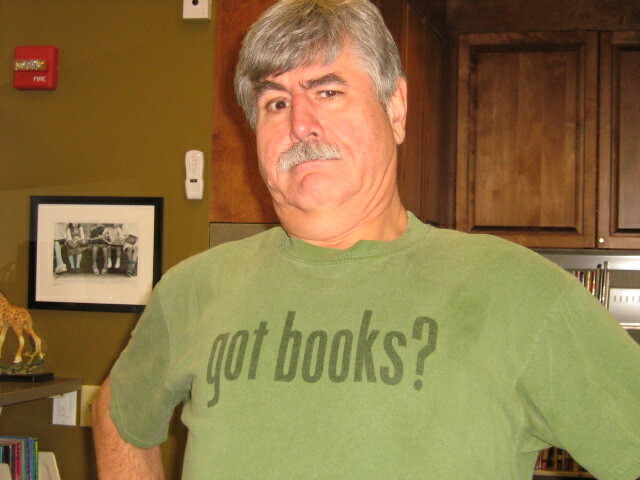 Except this time I'll do something different--I'm going to refer you to books I have reviewed before. It's been a while since these posts were first published, sometimes even a few years, but these books were terrific then and they're terrific now. HATCHET + GARY PAULSEN= a great read! Go and check it out!